Rich soil that holds moisture well. Morning sun with partial afternoon shade. 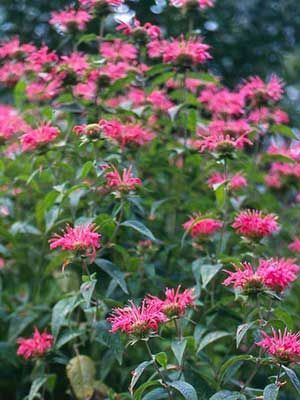 A cold-hardy perennial, monarda can survive temperatures to -20F (-30C). Topdress the dormant plants with good compost in winter. Lovage, Cosmos, Corn, Squash, Beans and Echinacea. Salad greens, other shade-tolerant plants. Start with purchased plants, set out in spring. Many selected cultivars are resistant to powdery mildew, a common problem with this species. 12" (30 cm) each way (minimum) is a good spacing for an initial planting of 3 plants. Monarda is a slight spreader, but not invasive like mint. Over time, a happy plant will form a mount 4 feet (120 cm) high and wide. Pastel flower colours look especially cooling in partial shade. Leaves are excellent for tea. Harvest stems to dry for tea in early summer, before the plants bloom. The plants will regrow after cutting, then bloom. Moving clumps every few years may help limit problems with powdery mildew.